It is described as a "powerful and historic story" with "shades of Dan Brown". Clues at the dig for Richard III, archaeologists suggest, point to a skeleton's discovery being one of the most remarkable find ever made in England. Ahead of DNA confirmation, those who were there have reflected on what could be their own place in history. 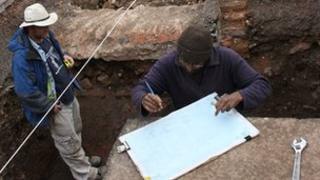 Archaeologist Mathew Morris, described how they made the first discovery in one end of a 30m-long trench. "We found one of his legs, sticking out into the trench from the side," he said. "You expect to find bits of bone in a churchyard because things get mixed up, so you then look for something connected to the leg and once you have that you know you have a burial. "We weren't entirely sure we were in the church at that point, we could have been in the graveyard outside the church, so we actually waited for a few days to be sure of where it was before we to looked at it." Work continued though, when the skeleton's location within the building was confirmed. Mr Morris said: "It was a very simple grave, we don't think there was a coffin he was just wrapped in a shroud but he was laid carefully in the grave, it was done with respect. "We cleaned all the other parts first but - because it is one of the fiddliest parts - we left the spine to last moment. "So it was right after we had the rest of him uncovered, and [the spine] was really obviously curved and we looked at each other and said 'Wow, this is a really good candidate'. "And when we lifted the spine, we found [an] arrowhead!" Dr Jo Appleby, University of Leicester osteoarchaeologist, said they were still sceptical even as the excavation was being carried out. "We thought it was pretty unlikely to be Richard III," she said. "So it was quite a shock when it began to show the characteristics it did. "We found the damage to the head and that set a few alarm bells ringing - but of course we live in a world where you just don't find dead kings! "I told myself it was just coincidence, it was some other guy, lots of medieval people were involved in battles. "But when we got to the spine and we saw that kink in it, it was incredible. If you had a tick list of what you wanted to find, this was it." The bones also provide powerful evidence of a violent death. "We haven't looked at all of the skull yet but we have two wounds so far," said Dr Appleby. "Basically, a slice has been taken off the back of the head and there is also wound to the top of the head, very small on the outside but causing a lot of damage inside, caused by something more pointy." Mr Morris said the team's achievement was not clear at first. "We didn't get off-site until seven in the evening, with the sun going down and we were under such pressure to do it properly that we didn't think about it much," he said. "But driving home that evening it began to sink in what we might have done. It was a surreal evening. "As an archaeologist people always ask what the best thing you have ever found is. I used to have to think about that, not any more."